Google Docs is a hosted (online) service where you can create, store and share documents, spreadsheets, presentations and online forms. You can also import documents from MS Office and Open Office: Google Docs will convert them to HTML and make them available for you to work on them on your own or share for viewing or editing by selected people or the world. Collaborators can access it from any computer with Internet access. They won’t lose work because it saves automatically. Users can also access the Google documents offline if they install Google Gears and synchronize them (this is a great option for low-bandwidth users that cannot be connected all the time). Google Docs is a great tool to write documents collaboratively because it’s online so anyone with an Internet connection (even low-bandwidth users) can easily reach the document. Plus, it’s got version history: you can have up to 10 people editing at the same time and you can see their names at the bottom of the page. Working with so many people at a time can be confusing and someone may easily remove what others have written. In this case, a good practice is to agree with the collaborators that they should not delete content, but instead add comments to something that in their opinion should be removed. Anyway, the version history function will help you keep track of the changes in the document. Remember that with your Google account you also have GTalk, Google instant messenger, enabled: this allows you to chat with your colleagues as you are editing in real-time so you can easily avoid overlaps. If your goal is to publish the final document, you should consider that writing styles can vary, and all the ideas your collaborators provide may not be relevant for the final document. It could then be a good idea to identify a moderator who is in charge of capturing the edits/comments and finalizing the document. Note that while Google Docs is excellent for basic editing and collaborative writing, you still need support from other tools for final formatting and presentation, once the collaborative input has come to an end (E.g: MS Word, Adobe InDesign). If you have already started a document in Word, you can upload it to Google Docs (with .doc extension – maximum 500k). It will be converted to the Google Doc format and be available for you to start sharing it with collaborators. Microsoft Word 2007 (with .docx extension), Rich Text (.rtf), OpenDocument Text (.odt) and StarOffice (.sxw). Place your cursor next to the area on which you would like to comment. 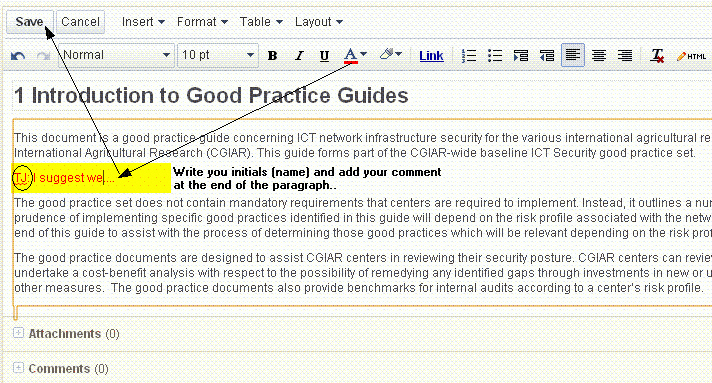 Then, select Insert> Comment, and a highlighted line will appear. You can have as many comments as you like. You can also discard comments, add to them, and change their color by right-clicking on them. Go to Tools > Revision History and you will see the different versions available: click on any one version to display it. You can revert to the one you’re viewing by clicking on Revert to this version . While Google Docs is a great tool to collaboratively write documents, I found that Google Sites is a great alternative when you have more than one document to edit and when you want to share additional information at the same time. Google Sites is a wiki-based solution that allows you to quickly gather a variety of information in one place – including videos, calendars, presentations, attachments, and text- and easily share it for viewing or editing bya small group, the entire organization, or the world. We started from a base document in Word. We created a page for each document and sub-pages for each section of the document, so that the invited collaborators could write their comments or edit online. Then, we appointed a moderator to keep track of the changes and provide the final document based on the comments posted on the site. When the document was final, it was uploaded again to the site for another round of comments, wherever necessary. If you already have a Word version of the document, upload the document on the page and ask people to download and print the document. Create a page for each section of the document to facilitate the edits and comments per section, and copy and paste the content to the page. (Note: if the document is very long and you don’t want to create a page per section, you may want to consider Google Docs instead). In our case, the initial document was uploaded as an attachment, then the content was copied and pasted to each page and collaborators made general comments. 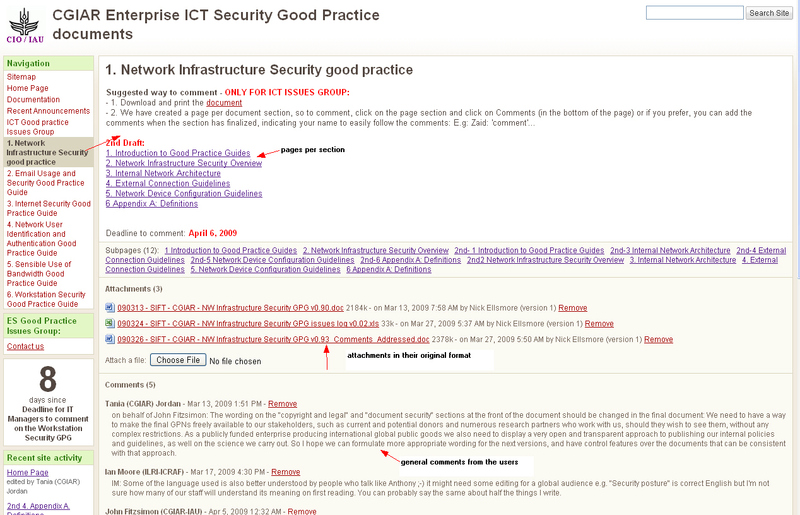 If collaborators have comments on the section in general, they can use the Comments area at the bottom of the page to post their comments. Another way to comment on the site is to click on Edit Page and add the comment directly in the page itself using a different color and writing name or initials to easily distinguish the collaborators. Want to get started with Docs and Sites? 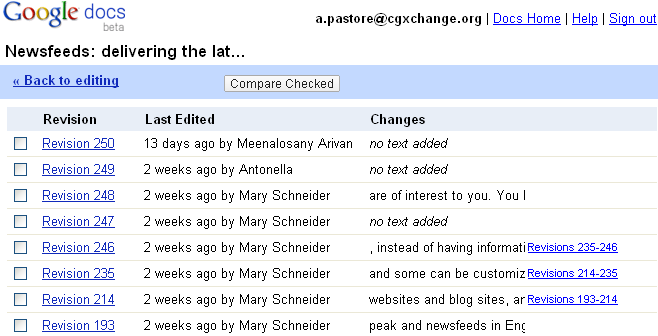 For CGIAR Users: CGIAR users can request an account at cgxchange.org Google Apps Education Edition. Browse the Get Started guides to Collaboration Tools, in particular Documents, but also Spreadsheets and Presentations. For users outside of the CGIAR: To set up an account, go to http://docs.google.com or http://sites.google.com and find there the instructions. You can either set up a Gmail account or create a Google Account with your existing email address. For a Google account, you can just enter your current email address and select a password. This would allow you to take advantage of all the free Google services. 3. Share the site. When your site is ready, make sure that the people you need to invite to edit and comment have a Gmail or Google account. Usually when I need to write a document, I start with a Google Doc, and then invite the people that I need to collaborate with. If I have additional content to share in relation to the same topic or project, usually I consider a Google Site which allows me to add and share web pages, documents, videos, calendars, Google gadgets and more. Actually, you can even embed the Google document you started on a Google Site as well (just remember to share the Doc with all the people that have permissions on the Site). Note that while Google Docs and Google Sites are great tools for collaborative text processing, they are not so efficient for final document layout (at least for now); in order to provide a final document layout, you still have to use other specific word processing or desktop publishing tools (E.g. Word, Adobe tools). Remember that you can decide which tool to use depending on your situation; but if you ask me, I would suggest you try them both so you can understand which tool is best depending on your particular situation. If you have any other collaborative writing experiences, we would be pleased to hear about them, so until the next time…happy writing! Working with virtual teams: blindfolded! Is it a jungle out there?